The process of creating an account is similar to any other web based application like Facebook, Gmail, etc. 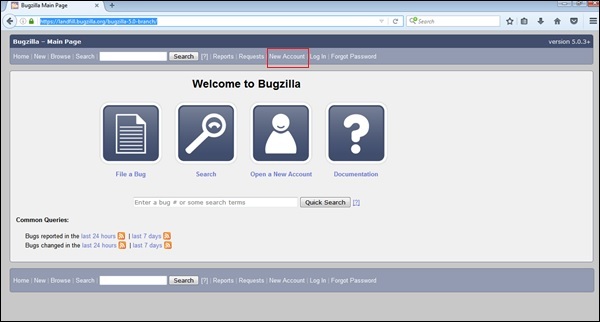 Step 2 − On the Bugzilla home page, click the New Account link placed on the header as shown in the following screenshot. Step 3 − Enter the email address and click on Send. Step 4 − Within moments, the user will receive an email to the given address. This Email should have a login name and a URL to confirm the registration. Step 5 − Once the registration is confirmed, Bugzilla will ask the real name (optional, but recommended) and ask the user to type their password and confirm their password. Depending on how Bugzilla is configured, there may be minimum complexity requirements for the password. Step 6 − Once the details are filled, click on Create, a successful message of account creation displays on the screen, else it will display an error message. Correct the error and then click on Create.